Editor’s note: Albany junior Peter Hooley, a guard from Australia, became the first star of March Madness with his game-winning shot to beat Stony Brook in the America East title game, propelling the Great Danes into the NCAA Tournament. That shot came less than a month after he returned from Australia to be with his mother Sue, who died of cancer on Jan. 30. I sat on the edge of my bed, my head in my hands, eyes closed, just thinking about how I was going to prepare myself for this big game. I wanted to win this championship more than anything in my life, for my team, coaches, my family and most importantly — for my mum. I put my hand on hers, held it to my chest, closed my eyes and just started to talk to her. It may seem crazy, but in that moment, more so than any other, I knew she was listening. Little did I know that what was about to transpire would change my life forever. It wasn’t the perfect game, in fact it was far from it, but we hung in there. After everything this team had been through this year, we weren’t about to give up the fight then. We knew that if we stayed the course, then someway, somehow, we’d find a way. Down two to Stony Brook with under 10 seconds to go, Ray Sanders drove the lane and missed a tough layup, and then amongst the crowded hands around the rebound, the ball was somehow tipped to me at the top of the key with 1.6 seconds left in the game. Peter Hooley (right) and Sam Rowley accept the America East championship trophy for their win over Stony Brook. I caught it, and let it fly. After Mum had passed away in late January, I often found myself sitting outside, just gazing at the sky. No words. Just thoughts. How was I going to get back on the court, knowing my mum wouldn’t be watching? She never missed a game. She was always the first message I got, reminding me to hold my follow-through when I shot, telling me how proud she was, and to, most importantly, keep flying. How was I going to get back out there, knowing those messages would no longer appear? Going home to Australia in the middle of the season was hard, leaving the team was hard, too, but they made it easier for me — being in constant communication and showing me love every step of the way. Plus, their on-court success gave my family a special feeling, seeing them come together during this tough time for us. During the last few days, while Mum was in hospital, I would sit by her side, and we would just talk about everything. She made me promise her that no matter what, I would go back and finish what I started. That shot though? It felt good, but as it flew through the air, it didn’t look good. However, I can only believe Mum had other ideas as that ball found the bottom of the net, giving us our third championship in as many years. A storybook ending, written in the stars, turned my worst heartbreak into my beautiful miracle. 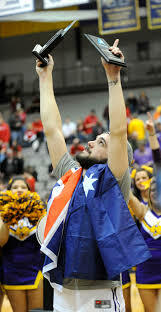 Peter Hooley hoisting his MVP trophy after the America East title game. I started to get endless messages from people saying how that single shot had inspired them, and it made me start to realize just how incredible this miracle was. From radio interviews, to newspapers, I then found myself on the way to the ESPN studios in Bristol, Conn., to appear live on SportsCenter. A dream of mine as a kid became a reality as I sat in the studio alongside John Buccigross and Steve Levy on live national TV. A chance for me to tell my story to the world, in hopes to inspire some people to keep flying through the tough times. Never would I have ever thought this would happen, and as hectic as the journey it has been, it’s been incredible and something I will never forget. Now, this team gets to dance their way into March Madness, and it couldn’t have happened to a better team. We all have each other’s back, and we aren’t about to back down from any challenge. Oklahoma, on Friday night is the next test for us, and it’s a mighty one. One of the best teams in the country stands in the way of us progressing. It won’t be easy by any means, but with what we have been through this year, starting 2-6, then to deal with all the midseason distractions, we know we can do anything if we stay and fight together. As for me, I’m enjoying this story of a lifetime and I know I must keep flying. But in each spare moment when I am alone, I can’t help but think back to that morning before the game, as I held my hand against my mum’s — that she was holding mine the entire time… and she would never let it go. This is what makes March Madness thrilling each year. There is always a Cinderella Story and or team. The small winning teams get a chance to bet the Dukes, Notre Dames, or Virginias. Though we are huge UVA fans and Albany and UVA are in the same bracket, I would bee thrilled to see Albany and Peter Hooley be Cinderella at the big dance this year! This entry was posted in Uncategorized, USA and tagged Albany Great Danes, inspiration, March Madness, Miracle, Mum Sue, NCAA Basketball Tournament, Peter Hooley, sports. Bookmark the permalink.